It’s a busy time of the year here, the school year is drawing to a close and summer holidays are just around the corner. And with the holiday season just about upon us, it’s also market season for me. I’ve got three coming up in the next couple of weeks, two of them this coming weekend and all local to me! 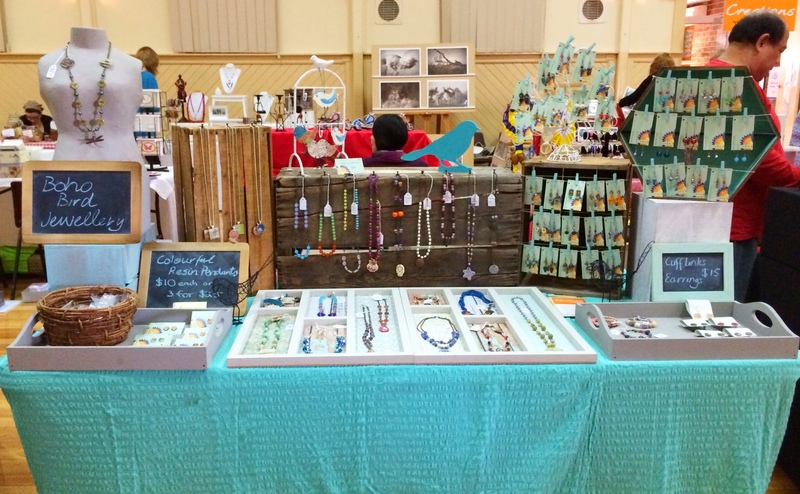 This Saturday is The Handmade Show, my regular monthly market. It’s literally just around the corner from home—I can walk there! It’s on from 10:30am-3:30pm if you happen to be in the area. Oh, and my Mum, who is a talented potter, will also be there with me! On Sunday I’m participating in a brand new market at The Breslin Gallery, a café and gallery down the street from me in the other direction! It’s a funky little gallery in a converted church and I’m looking forward to it. Just gotta hope the weather holds out, as the forecast is looking damp! It’s going to run from 9am-1pm. 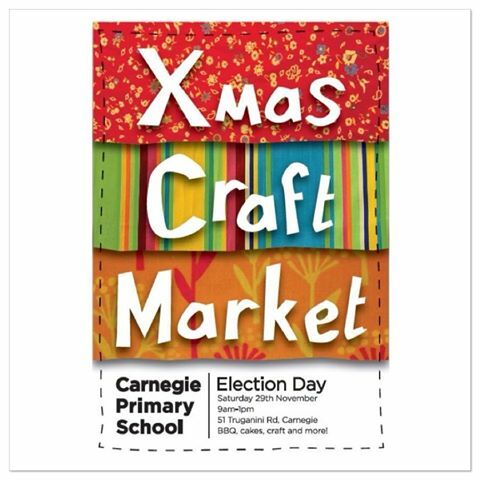 Then on Saturday 29th September our local primary school is holding its annual Craft Market, from 9am-2pm. It’s strategically timed to coincide with the school hall’s use as a polling place in our state elections, so I’m hoping that means plenty of people will come by. If you live in Melbourne, and want to get a head start on your Christmas shopping, I’d love to see you at one or another of these upcoming markets! Tell me you saw this blog post and I’ll give you a coupon to use on your purchase. 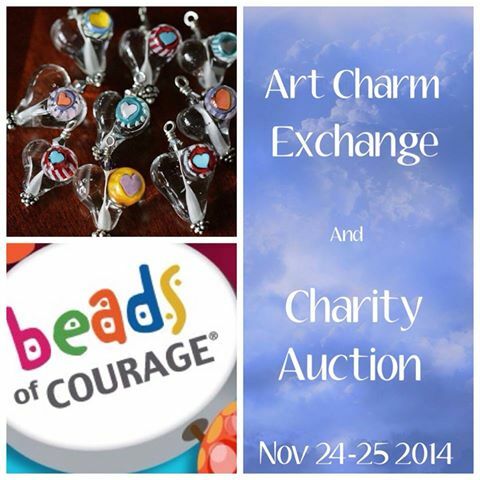 Finally, the Art Charm Auction for Beads of Courage has been postponed for a couple of weeks. Instead of kicking off this weekend, it will now be starting on Monday 24th November, in the evening, and the blog hop will follow on Tuesday 25th November. 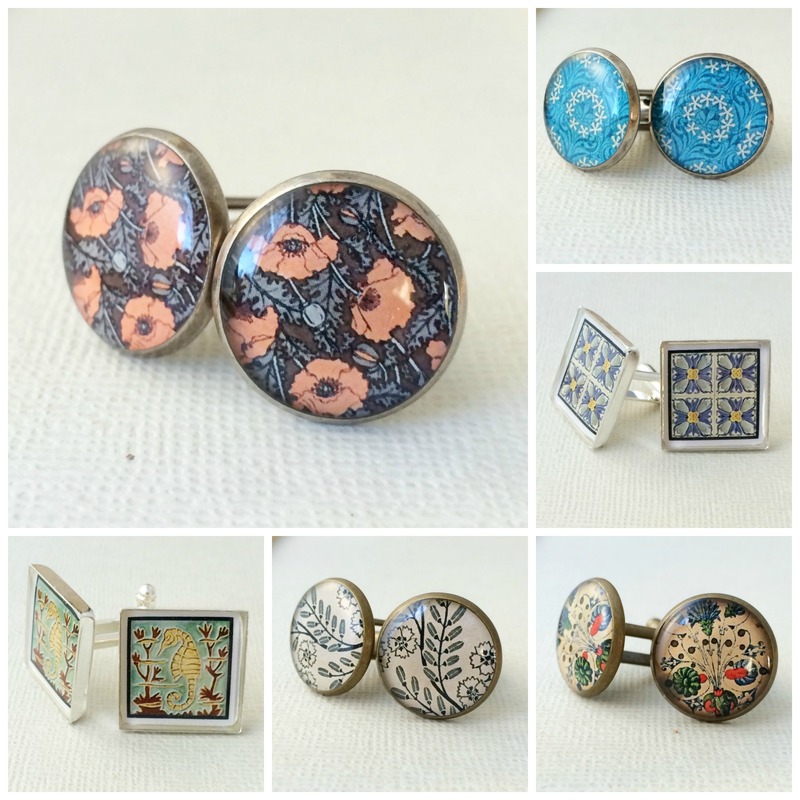 Here in Australia it’s Father’s Day on Sunday 7th September, and if you’re looking for a handmade gift for Dad, I’ve got new cufflinks to show you. 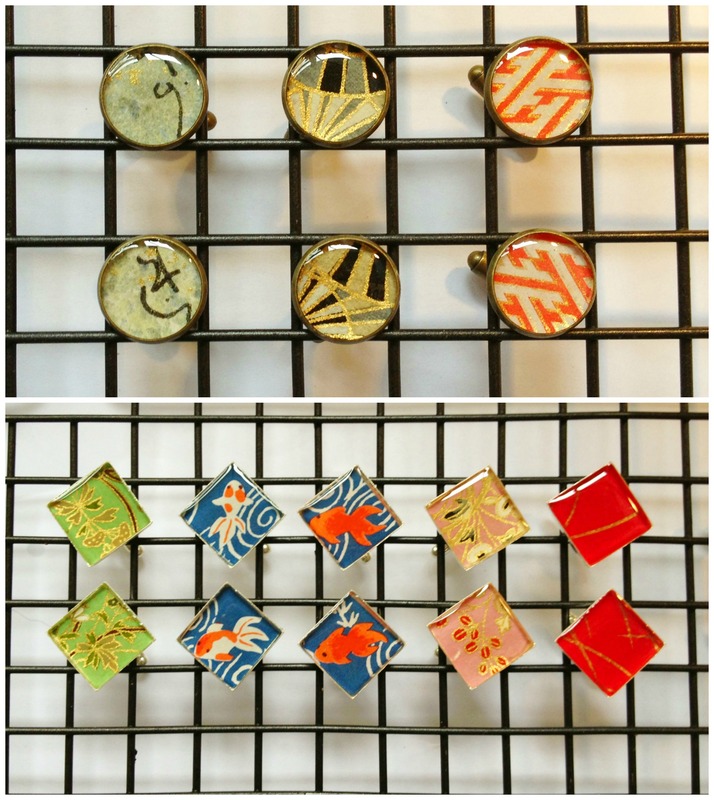 It’s always fun to find different papers and images that work well under resin to make interesting cufflinks. 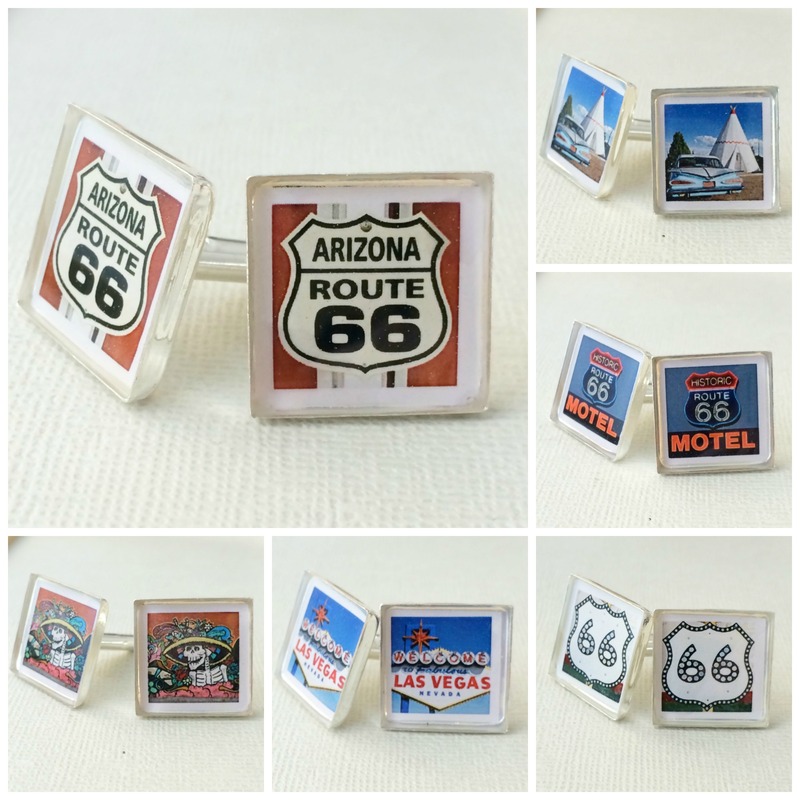 And this year I came across a great set of images from Etsy seller Valentine Grimm featuring iconic images and signage from the 50s and 60s such as the Route 66 sign, Vegas signs and more. I picked out a few that I thought might work, what do you think? From the same Etsy seller, I also picked up some pretty Art Nouveau tile designs and floral designs, as well as some medieval illumination-style images. I selected ones that I thought were not too feminine, although I realize that can be very subjective. My husband said he’d wear them, so that works for me! Finally, I made a couple of pairs using scrapbook paper with a musical theme. If you’re interested in buying a pair of these cufflinks, I will have them at The Handmade Show this Saturday, and on my Facebook page on Sunday or Monday. And if Father’s Day isn’t coming up for you, don’t forget there are only 19 weeks until Christmas! 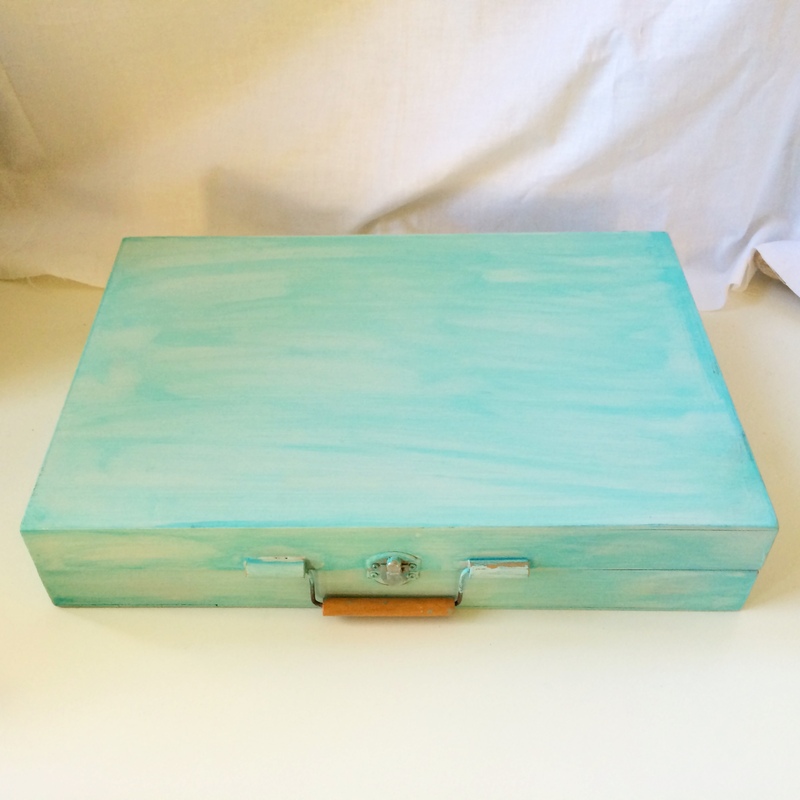 You know those little wooden boxes available at all the big box craft stores? Your challenge, if you choose to accept it, is to go get one and decorate it with whatever medium or mediums you what. You can paint it, decoupage it, felt it, bead it, and mix media it up to your hearts content. 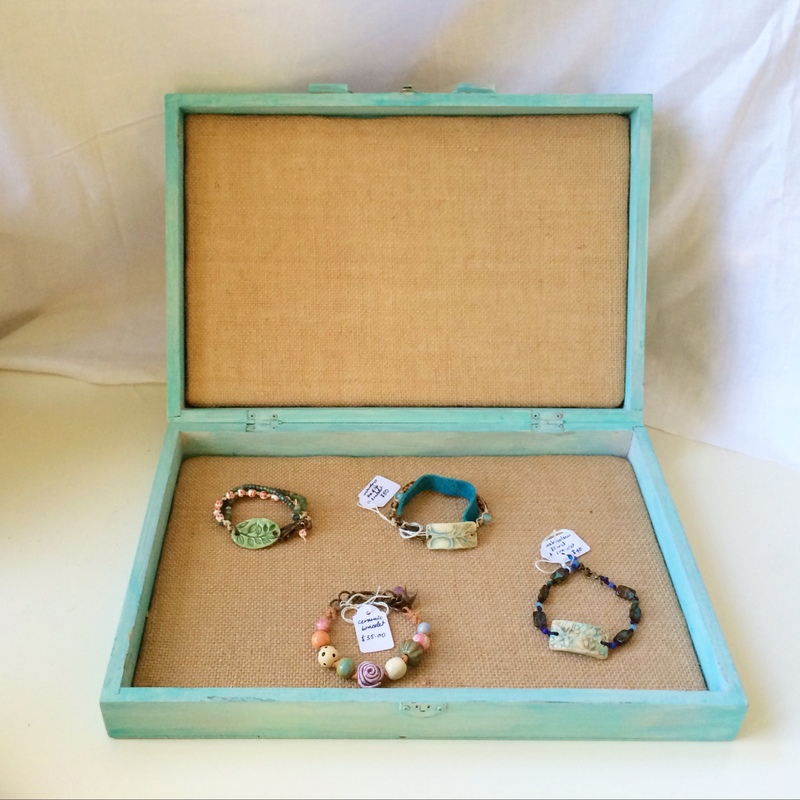 You can choose whatever size box you like, with or without a clasp. When I started doing shows about 18 months ago, I started to paint it, and then went on to easier things, like trays and papier maché busts. So it sat there some more. And then this challenge came along and I thought, aha! So I painted it inside and outside, first with a colour called Eggshell (it’s kind of a greyish off-white), and then with a lovely aqua blue called Sea Breeze, which I watered down a bit and also wiped with a sponge to get a streaky translucent effect. 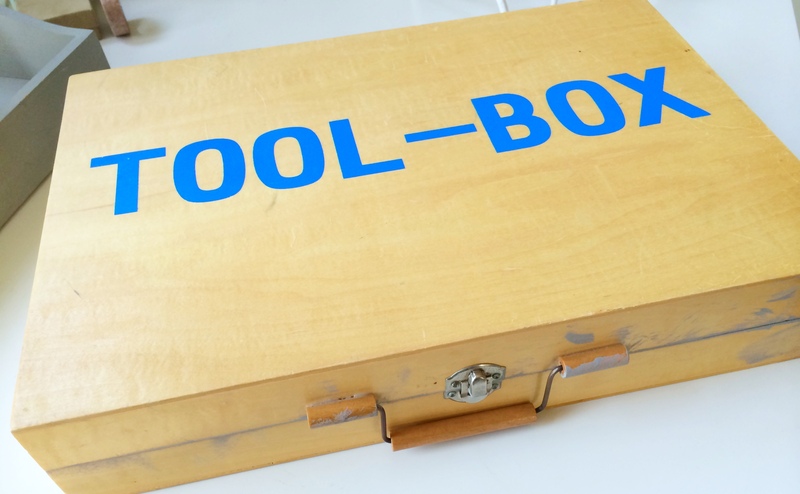 In retrospect, I probably should have sanded the outside of the box down, but it’s fine for the intended purpose. I took some foamcore board and cut it just a bit smaller than the inside of the box—two pieces, one for each side—and covered it with burlap. The pieces just pop in nicely, although I think I will get some double-sided tape and stick them in a bit more firmly. And voila! Would you like to see some of the other elements of my display sometime? Tomorrow’s table at The Handmade Show is my last one for the year, so if you live in Melbourne, come on down and finish off your Christmas shopping! 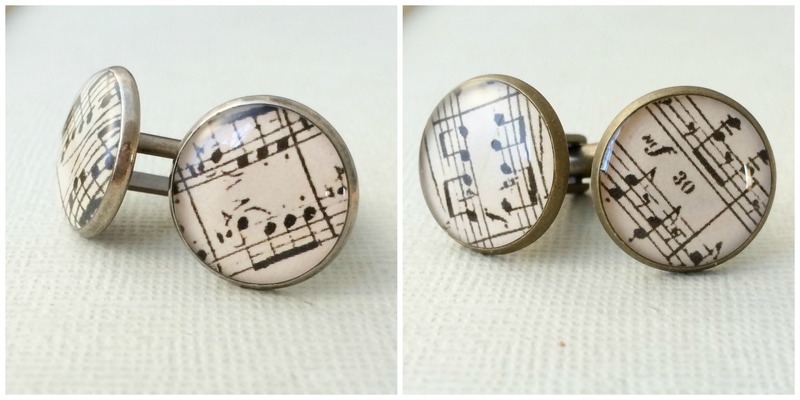 I have loads of pairs of earrings, necklaces and bracelets, and even a few pairs of cufflinks for the sharply-dressed man in your life! The market runs from 10:30am – 3:30pm and there are stallholders selling all sorts of handmade goodies including candles, cards, clothing, children’s toys, Christmas decorations and more. Activities for the kids include free face painting and a lolly-guessing competition. Cafe Handmade does a mean bacon and egg sandwich, among other delicious offerings. Musical entertainment will be provided by Marisa Rae Quigley. And there’ll be giveaways for market shoppers, including some for the kids. 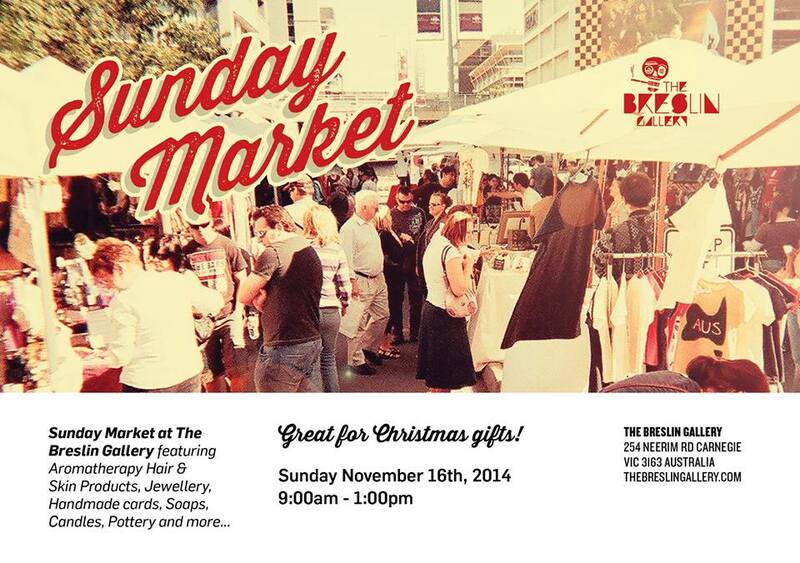 Just a quick post to say I’ll be at Bend and Snap Market in the Melbourne CBD this Sunday from 11am-4pm. It’s a quirky little market in a big gallery space behind the 1000£ Bend Café on Little Lonsdale St. If you’re a Melbourne local, I hope you can come along to see me, and get a bit of Christmas shopping done too. I’ve only got two more markets left this year after Sunday. I’ll be at the Carnegie Primary School Xmas Craft Market on Friday 6 Dec from 3:30-6:30 and at the last date for The Handmade Show on Saturday 14 December from 10:30-3:30. 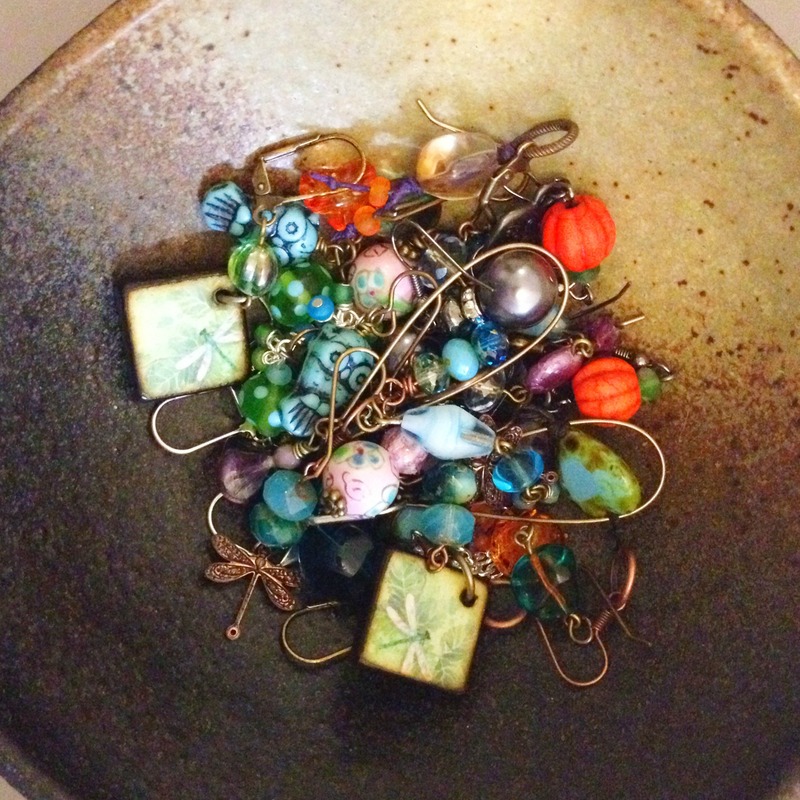 Here’s a new necklace and earrings I’ll be selling on Sunday. The pendant is from one of my favourite bead makers: Natalie Fletcher-Jones of Peruzi, combined with lovely aqua-blue Czech glass and antique silver-plated chain. … are you making your Christmas list yet? I’ve got a few markets between now and Christmas if you want to do some Christmas shopping. Tomorrow is the first of three stalls I will have at The Handmade Show, at St Anthony’s Parish Hall on the corner of Neerim and Grange Rds in Glen Huntly. I’ll also be there on 16 November and 14 December. New to this market is the ability to pay by EFTPOS, through special arrangement with the market organisers. If it looks like a good option for me, I’ll sign on for my own EFTPOS setup. On Sunday 3 November, I will be at the Fitzroy Lions Market, which is at the Fitzroy Victoria Bowling and Sports Club, next to Edinburgh Gardens. I don’t know much about this market, but hopefully it will be a good day with lots of happy shoppers. And on 24 November, I will be back at the Bend and Snap Market behind the 1000£ Bend Café on Little Lonsdale St in Melbourne CBD. I didn’t have a great day at this market last month, so fingers crossed next time the Christmas crowds will be out in force! 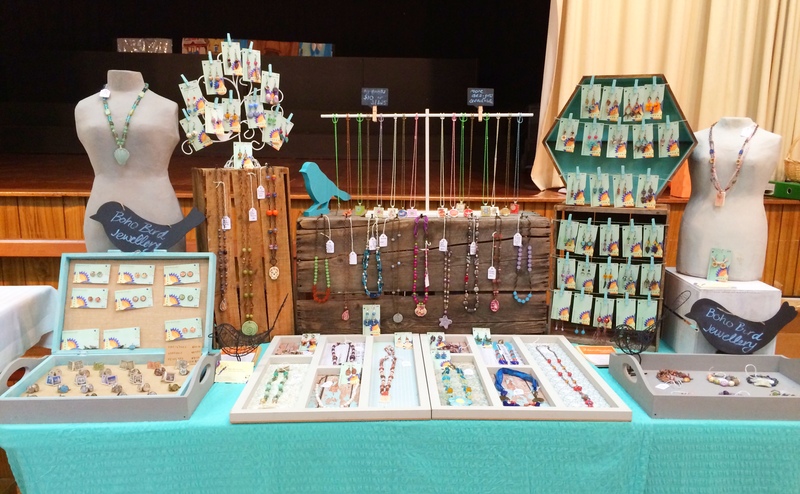 It looks like my girls’ school will have another twilight craft market in late November or early December, and I will do that one this year too. 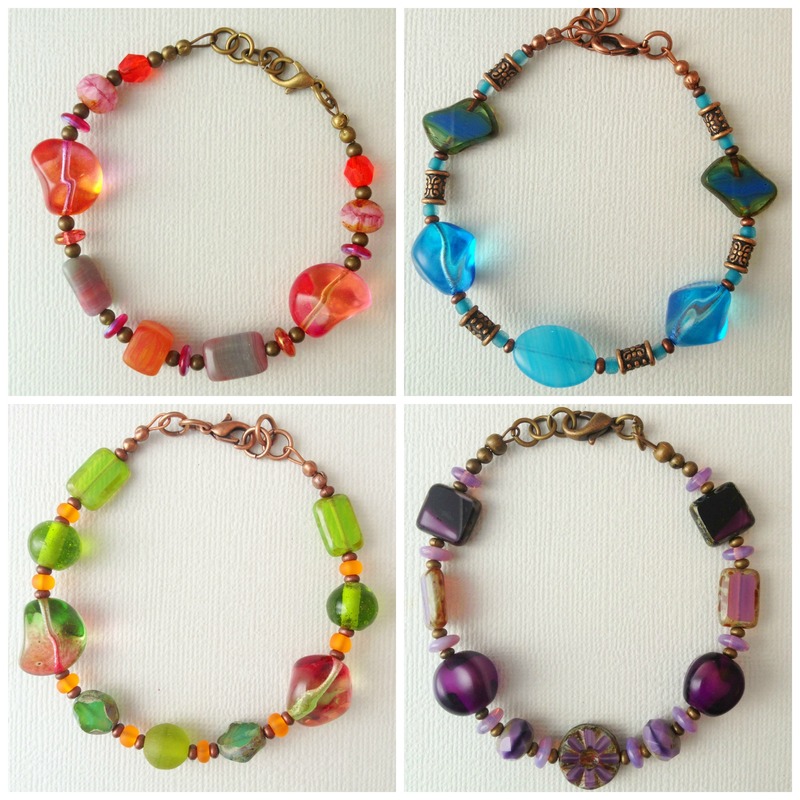 I’ll be selling jewellery appealing to the primary school set, as well as some easy and inexpensive Christmas stocking stuffers like earrings and cufflinks. And I promise my Etsy shop will be open soon! I have just not had enough time to work on it recently! 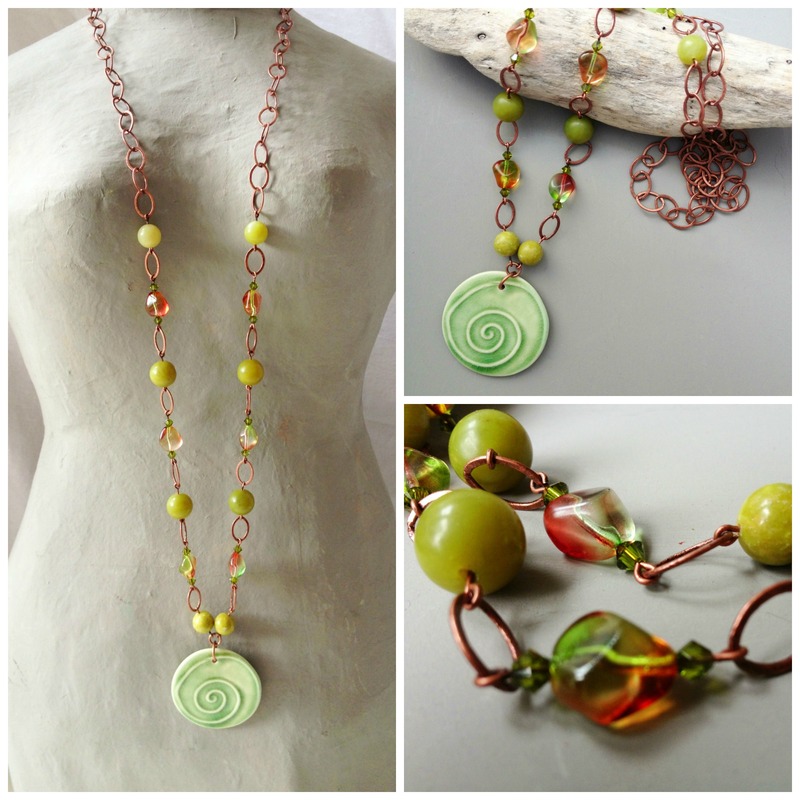 In the meantime, if you see something you like, drop me a line via my Facebook page. I’ve got a table at The Handmade Show this weekend and I’m busy getting a few last minute things ready for it (earrings anyone??). As it’s Father’s Day in Australia at the beginning of September, I thought I would make some cufflinks. I do have one small problem though, I have no idea how to display the cufflinks on my table. Any suggestions? 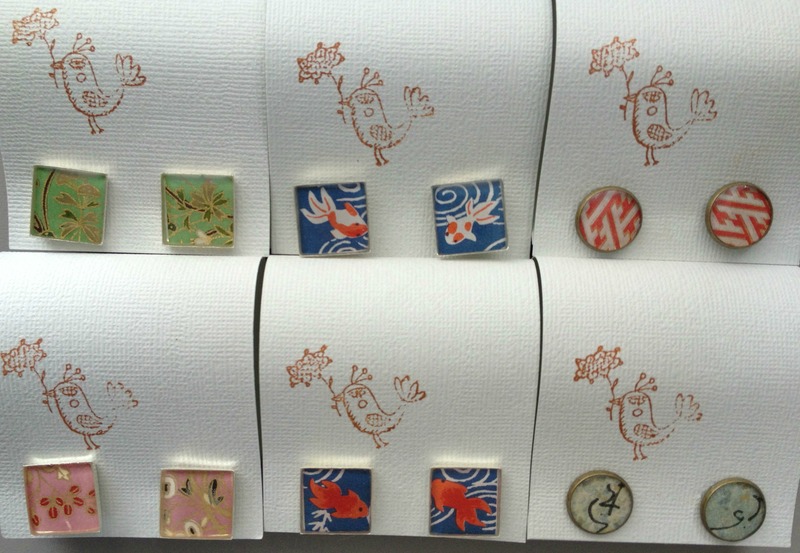 If you’re in Melbourne this weekend, think about coming to The Handmade Show. It’s nice and warm inside, there is great entertainment from crooner Frank Lee Darling, facepainting for the kids, plus 30 stalls packed full of great handmade stuff. And me, of course! PS: this is my 99th post. Stay tuned for something fun for post number 100!! !